Charles Reagan Wilson documents, for the first time, that for over half a century there existed not one, but two civil religions in the United States, the second not dedicated to honoring the American nation. Extensively researched in primary sources, Baptized in Blood is a significant and well-written study of the South’s civil religion, one of two public faiths in America. In his comparison, Wilson finds the Lost Cause offered defeated Southerners a sense of meaning and purpose and special identity as a precarious but distinct culture. Southerners may have abandoned their dream of a separate political nation after Appomattox, but they preserved their cultural identity by blending Christian rhetoric and symbols with the rhetoric and imagery of Confederate tradition. “Civil religion” has been defined as the religious dimension of a people that enables them to understand a historical experience in transcendent terms. 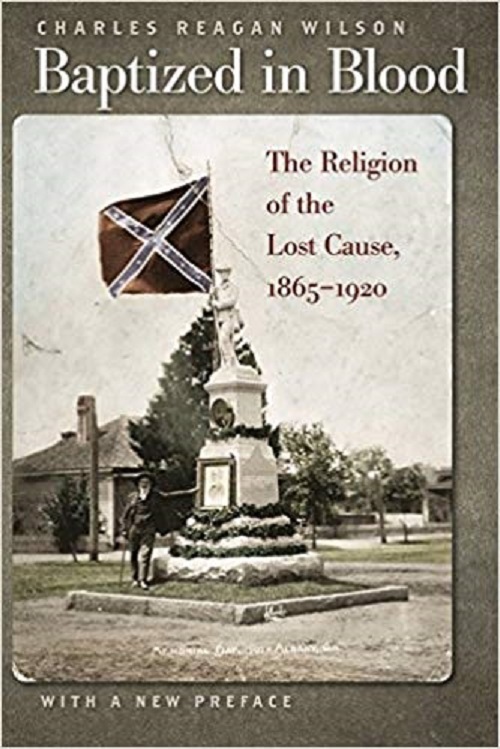 In this light, Wilson explores the role of religion in postbellum southern culture and argues that the profound dislocations of Confederate defeat caused southerners to think in religious terms about the meaning of their unique and tragic experience. The defeat in a war deemed by some as religious in nature threw into question the South’s relationship to God; it was interpreted in part as a God-given trial, whereby suffering and pain would lead Southerners to greater virtue and strength and even prepare them for future crusades. From this reflection upon history emerged the civil religion of the Lost Cause. While recent work in southern religious history has focused on the Old South period, Wilson’s timely study adds to our developing understanding of the South after the Civil War. The Lost Cause movement was an organized effort to preserve the memory of the Confederacy. Historians have examined its political, literary, and social aspects, but Wilson uses the concepts of anthropology, sociology, and historiography to unveil the Lost Cause as an authentic expression of religion. The Lost Cause was celebrated and perpetuated with its own rituals, mythology, and theology; as key celebrants of the religion of the Lost Cause, Southern ministers forged it into a religious movement closely related to their own churches. In examining the role of civil religion in the cult of the military, in the New South ideology, and in the spirit of the Lost Cause colleges, as well as in other aspects, Wilson demonstrates effectively how the religion of the Lost Cause became the institutional embodiment of the South’s tragic experience.